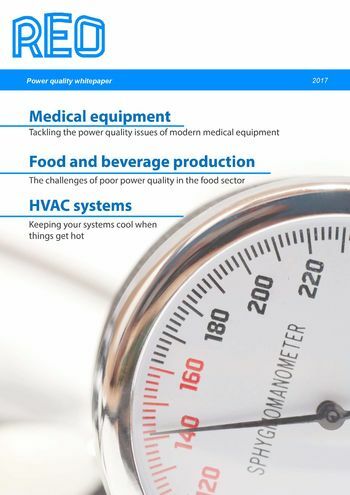 REO UK has released a whitepaper addressing electrical interference and power quality problems in the food and beverage, HVAC and medical sectors. The whitepaper, available to download for free outlines the issues caused by technological development in each industry, as well as how electrical engineers and plant and facilities managers can mitigate these problems. Many of the electrical problems mentioned in the whitepaper, such as harmonics and power line interference, have traditionally been synonymous with industrial settings. However, the rise of electronic devices using power line communication (PLC), as well as portable device chargers that use switch-mode power supplies (SMPS) in a wider range of sectors, has increased the number of power quality problems in facilities. One such example is commercial HVAC systems. The increase in bring-your-own-device (BYOD) workplaces has meant that office electrical infrastructure must now handle a larger number of electronic devices, such as smart phone chargers and laptops. These devices often use a SMPS, the high frequencies of which cause electrical harmonics that impact the performance of HVAC systems by damaging components. This subsequently increases energy costs and reduces the lifespan of the system. “In the past fifteen years, we have witnessed an unprecedented technological boom,” explained Steve Hughes, managing director of REO UK. “This has brought new challenges to electrical engineers in non-industrial environments, who must now invest in new equipment to mitigate the risks of poor power quality. Electrical engineers can use this whitepaper as a pocket guide to these emerging problems. “It is not just facilities that are facing new problems as a result of technological development. In food and beverage packaging plants, for example, we have seen an increase in laser microperforation equipment. The laser makes tiny holes in food packaging to keep it fresh and extend its shelf life. This equipment requires a high frequency capacitive electrical load to operate, but this often results in voltage fluctuations in systems without an effective SMPS. This ultimately leads to poor laser performance due to an unstable electrical supply. Electrical engineers and facilities managers interested in learning more about modern power quality considerations in the food, HVAC and medical sectors can download the whitepaper from REO UK’s website. For more information on power quality equipment in industrial plants, commercial premises and healthcare environments, contact the company on 01588 673 411.